Today, the grandmother of Bilind was very joyful. She made jokes and was laughing all the way to Sheba. Bilind got his final echo, ECG and weight check. All were good – he gained some weight, ECG and echo were fine. He has a very mild left pulmonary artery stenosis. He is otherwise fine and can get his nourishment and vaccinations as any healthy child. He is safe to fly to Kurdistan. We waited quite a long time (2.5 hours) to get the medical report for Marya who was also with us. Grandmother of Bilind has pain due to kidney stones and a malfunctioning hip, but she is now happy to be at Shevet! Blessed is the Lord! When I arrived at the hospital I could see a large group of Shevet children and their families. Today was a really busy day at the hospital. Because we had four echos, two visits, two surgeries, and two new families arriving. One of the echos was for our little sweet Bilind. When I saw him he was sleeping in the arms of his loving grandma. The nurses took vital signs, ECG, and an echo. So Bilind and his grandmother had a long wait for the doctor. Finally the doctor called us. The doctor wanted to see Bilind to check his stomach and there was a little bit of trouble communicating Bilind’s condition to his grandmother. She was very worried because Bilind is only 2 months old and he has been crying a lot and his stomach is a little hard sometimes. 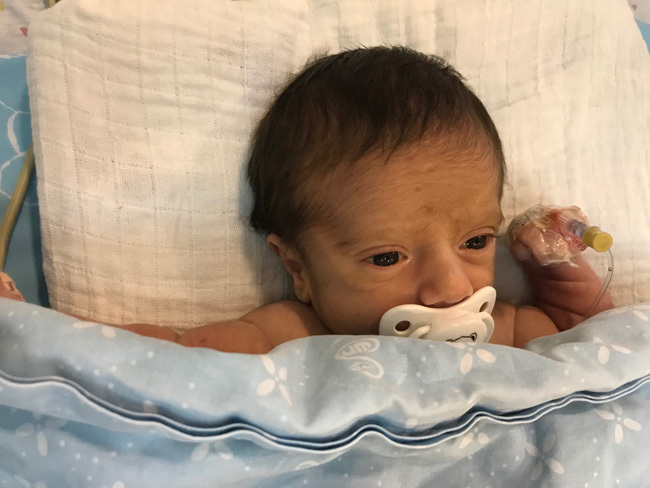 Bilind has reflux and colic, which is so common in babies like Bilind. He is taking medication to help this condition. The doctor was very pleased with Bilind’s heart today. The doctor said his heart looks stronger than the last echo. So he decreased the medication and he is going to have the next follow-up in two weeks. Hopefully after that he can go home. Grandma was very happy to know that soon they can go home. 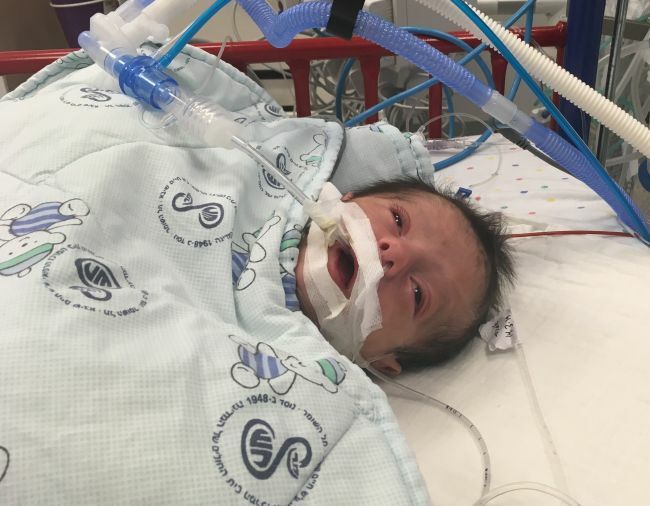 Please pray for our little Bilind’s stomach problems and for his complete and soon recovery and for strength for his grandmother. 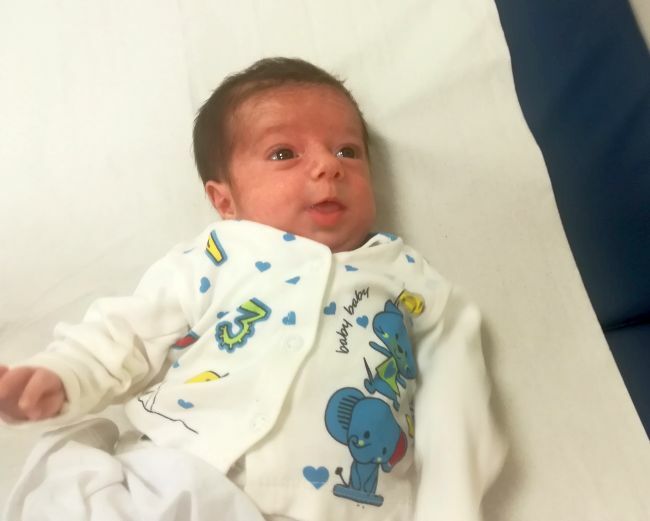 We came across Bilind and his grandma in the echo area of the hospital today whilst we were there with 3 other children. He was waiting for his last echo before being discharged to us at home! This news was a surprise to us, but we happily sent the news back to the team at home, who organised a bed for the grandma, so our house is completely full now! Yousif, Joseph and Suhail were able to bring them back home, and so we are praying that they will settle in well. Bilind is going to have an echo in 1 week, so please pray for his recovery. Today we visited Bilind and his grandmother in the hospital. He looked so cute while he slept. He is now in the secondary ICU and doing well. The grandmother is very happy about that. Thank you for all your prayers. In the morning we went to visit our beautiful Bilind and his lovely grandma. I was very happy to see him without sedation and his eyes open looking at me. The doctor told me that maybe this afternoon he was going to be extubated. He is stable and his heart is a little stronger than before because he has medication that support his heart function at this time. We had a beautiful time with his grandma. We went together to the hospital’s kitchen and had lunch. I spoke with Bilind’s uncle and explained to him about Bilind and he explained that to grandma. Grandma always is smiling, she is so beautiful. In the afternoon, just before leaving the hospital Magda went to say bye to grandma. She saw that our beautiful Bilind was extubated! He only had nasal canula for oxygen. We were very excited to know that. 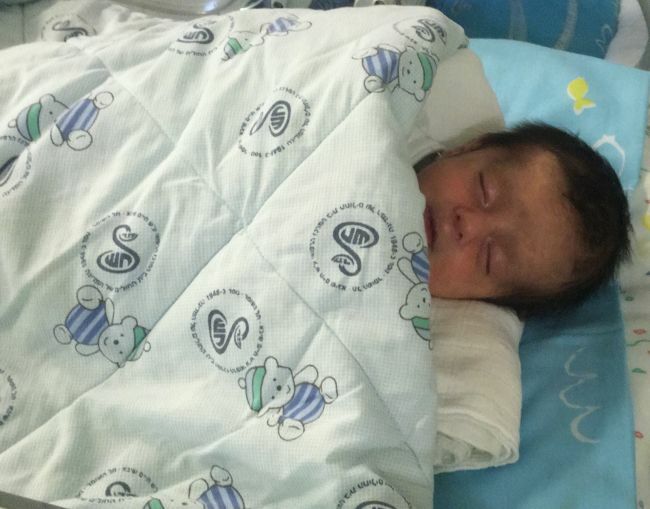 Please pray for our beautiful Bilind that everything continues well, for his quick recovery and strength for his amazing grandma in this time in the hospital. As I entered the ICU room of Bilind today, it seemed like his grandmother thought it’s her chance to come out. With sparkling eyes, she grabbed my arm and asked me whether we can go and meet the other families. “Of course,” I said. So, we started on our path. It was quite a little adventure with her. We both had trouble understanding each other so it caused many small misunderstandings that we laughed about. Also, because of her age, she has some troubles walking. But when we nearly reached the other waiting families, she walked faster and faster. I really had to smile about this humorous and determined woman. As she chatted with a father of another small baby, she laughed a lot and her eyes sparkled again. “She can’t lose you, because she has no idea how to get back to her room,” the father translated laughing. Then, we continued to walk to the mom of Birhat. As we reached her they both chatted a lot. For me, it seemed like Birhat’s mom found a grandmother figure with the grandmother of Bilind. Likewise, Bilind’s grandmother found a granddaughter in Birhat’s mother. When they finished their chat, we headed back. It was a really nice short excursion. Being back at ICU, she thanked me a lot and I finally had the chance to talk with the nurses about Bilind’s condition. They are trying to extubate him today! Praise the lord! Also his medication for blood pressure will decrease. So, Lord willing, he will breath on his own soon. 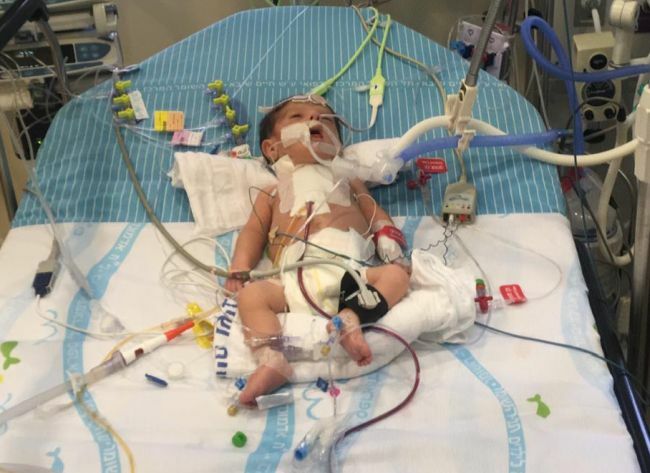 We must really pray for this beautiful tiny boy and his lovely family. May they find their hope, strength and optimism not only in their community but in the lord our father. He is the only real joy-giver. 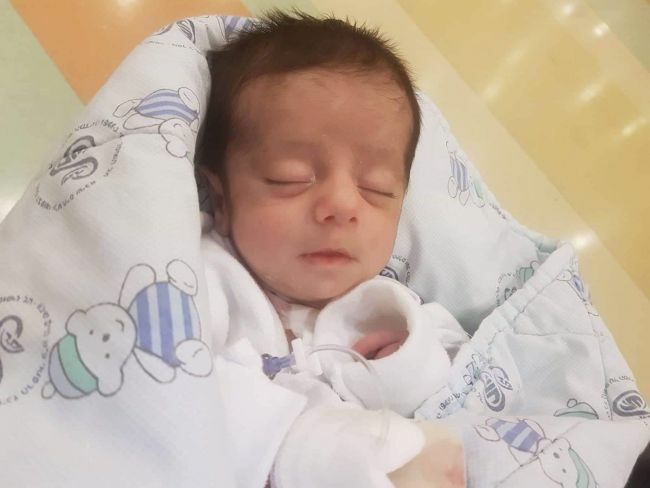 Just 2 days ago I held tiny little Bilind in my arms as the surgeon explained that surgery posed a risk to his life now but was his only hope for life in the future. 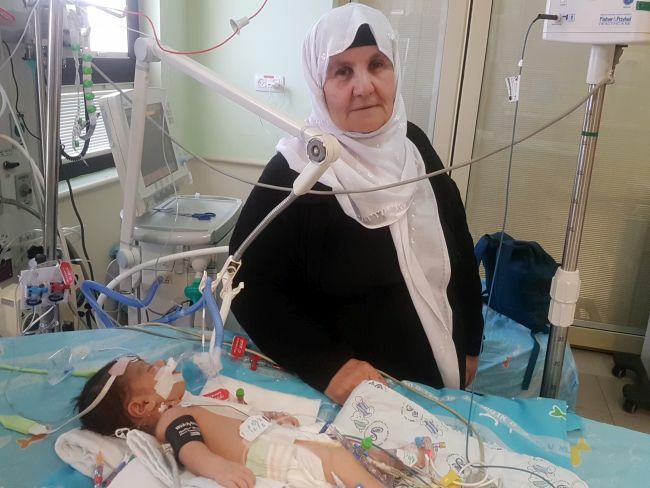 Today, little Bilind lay covered in wires and tubes in the ICU with his devoted grandmother by his side. Bilind is currently still intubated as his heart muscle is weak at the moment. The doctors are planning to give him strong medication to try and make the muscle stronger in order for the medical team to attempt extubating him tomorrow. Bilind’s Grandma and I spent a long time gazing on his beautiful little body with both of us thanking God for his creation. I was able to spend some time specifically praying for both Bilind and Grandma and this was such a special thing to do. I so long for these two to know Jesus as their Saviour. Please join me in lifting up Bilind in prayer, may Jesus take hold of his heart and make it strong. 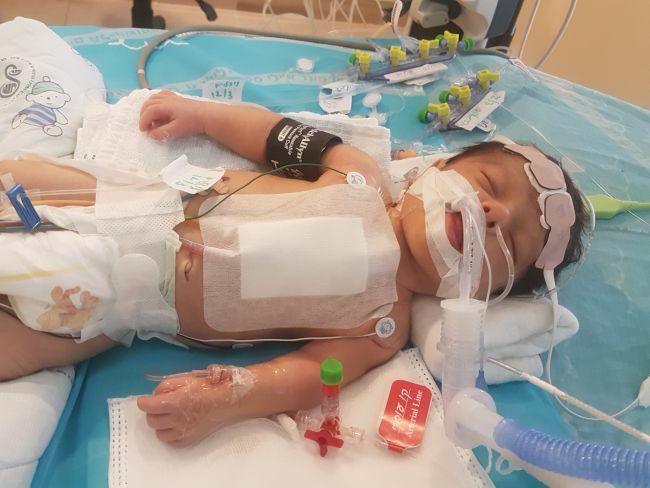 Today, Bilind had his complicated heart surgery. After 5 hours we got the information that the surgery went well. The grandmother is very happy about that. Please keep praying for Bilind. 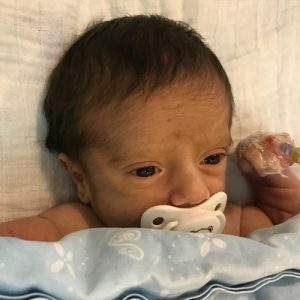 This precious 6-week old and his grandmother made the journey to Israel for his heart surgery. He slept through most of the van ride to the hospital, with nurse Diana reassuring his anxious grandmother. After his first round of tests, it was determined that he will remain in the hospital for observation until a surgery date is decided. 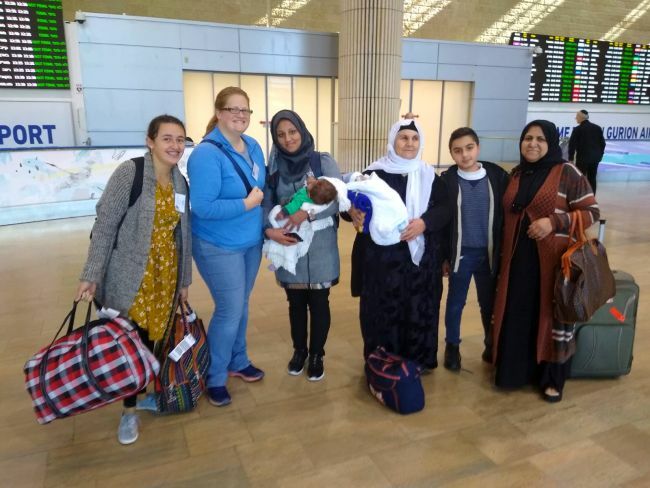 Praise God for the safe arrival into Israel. Pray for God’s timing on the surgery for this sweet child. As of right now, Bilind still needs $6500 toward surgery and related expenses.